Happy Pink Saturday! 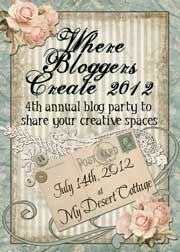 Hard to believe that Bev has been hostessing this crazy little event for a year now, but "shore 'nuff", that is the case. I must have been feeling the love when I posted my auctions on Ebay this week, because these represent 5 out of the 6 things I have up right now, all PINK. 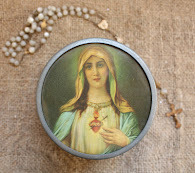 Thought you might enjoy seeing them since they are very fun antique and vintage pretties. First, a wonderful 1940's or 50's hat that I bought on my recent vacation to Florida. 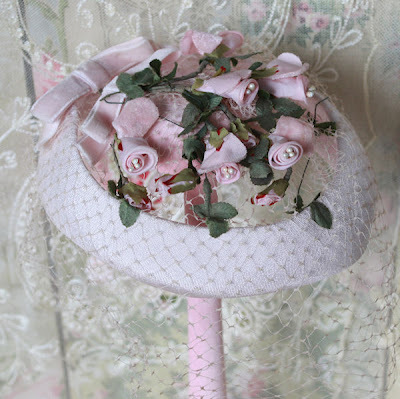 It is covered with pink organdy and velvet rosebuds (on a pink velvet hatstand, of course). 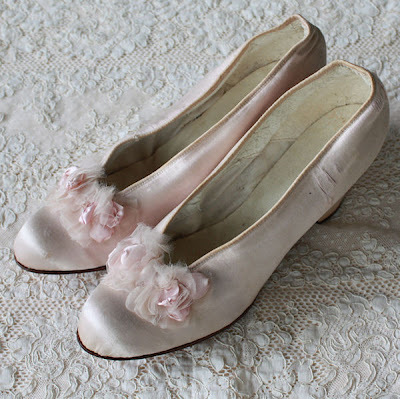 Next, a wonderful pair of 1920's silk shoes with adorable rosettes on the toes...can't you just see a little flapper gal doing the Charleston in these? 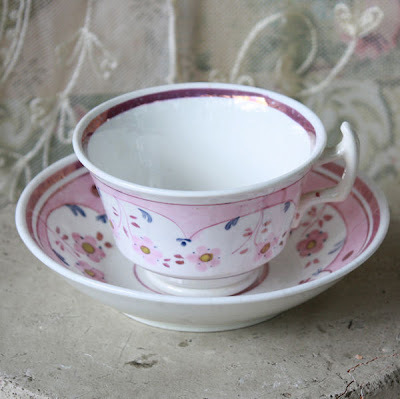 Antique English pink lustreware cup and saucer. Makes you want to have a spot of tea, doesn't it? One of my favorites of all time (why am I selling it??? 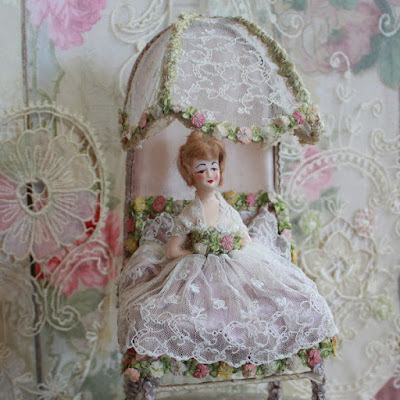 ), a 1920's half doll boudoir lamp with the prettiest little half doll perched on a tricked out ribbonwork and lace canopied chair. 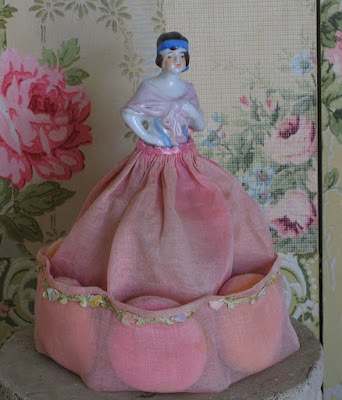 The light is under her skirt, giving her a soft glow when it is turned on. 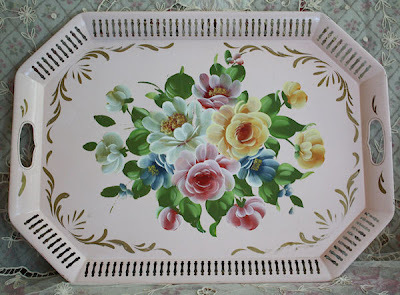 Lastly, one of the prettiest handpainted tole trays I've ever come across, in almost mint condition and...PINK with pink roses. Doesn't get any better than that, does it? 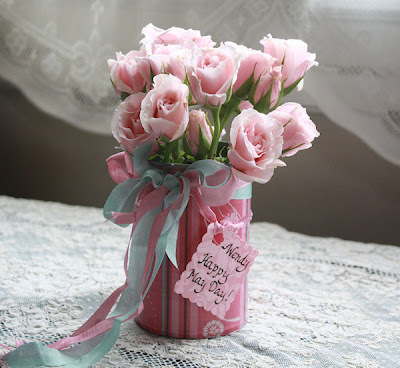 Well, I hope you enjoyed my little tour of pink pretties on this lovely spring Pink Saturday. I hope you are having a great weekend with your friends and loved ones. Next week, I hope to take you shopping with me to some of my local haunts. 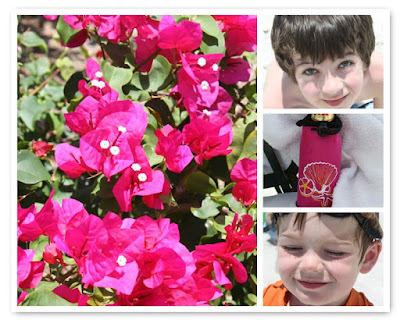 I wasn't going to do a Pink Saturday post this week since I am in Florida with my family on vacation, but then I started looking around and realized that I had lots of pink to choose from on this fine Pink Saturday. 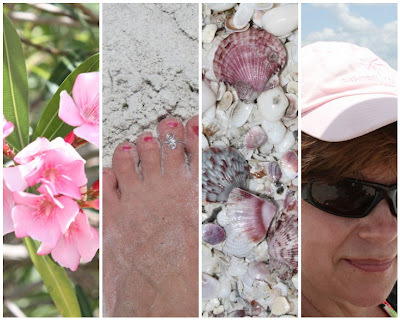 From left to right, we have pink flowers, pink sandy toes, pink seashells, and a pink hat. Who knew that there was so much pink just waiting to be discovered? And while you ponder this, pop on over to Bev's and check out the other Pink Saturday participants. You'll be glad you did! 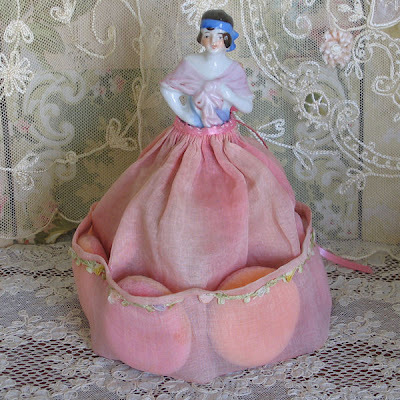 I thought you might enjoy seeing one of my Ebay listings which happens to be SO very pretty and...PINK! 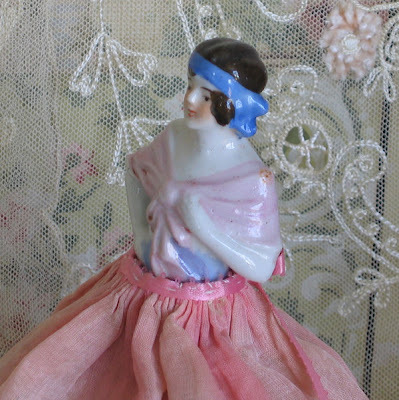 She is from the 1920's and is a powder puff holder. She holds 6 powder puffs in her skirt. Isn't she just adorable? I may have mentioned that I love 1920's flapper boudoir items. Some of them are totally useful, some are totally useless, but most are somewhere in between. I think the thought of the day was that if something held still, you should embellish it! And boy, did they. I am going to head out to the beach for a family vacation this week, so I must keep this post short and pack my swimsuit and book! When you read this on Pink Saturday, I will be either en route or enjoying the sand and surf. See you all when I get back (or before if I find something interesting...). 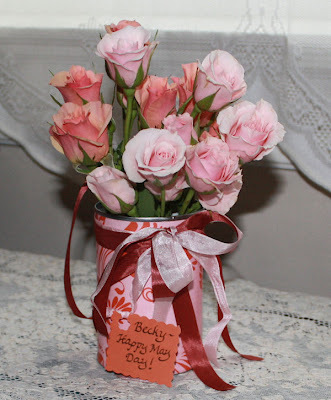 Until then, pop on over to Bev's and check out the other Pink Saturday participants. 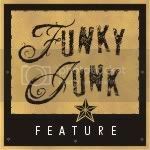 It's never boring! 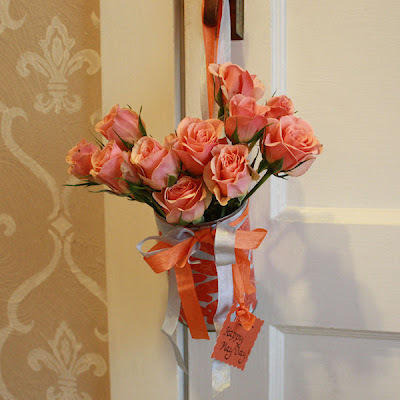 You would have been pleasantly surprised with one of these little pretties on your front door. Except for Wendy, because she caught me as I was hanging the vase on the door (thanks to Oliver, the Springer Spaniel who had to very loudly announce my arrival). The weather was very gray, misty, and cold, so it didn't feel like May Day, but the flowers cheered me up and hopefully did the same for my friends and neighbors. 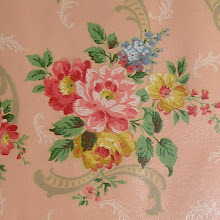 I hope you have a great first weekend in May and if you can break away from the spring cleaning and gardening, pop on over to Bev's at How Sweet the Sound who hostesses "Pink Saturday" and see what other participants have posted-it's usually pretty eclectic and fun with something for everyone! I actually spent all day yesterday deep cleaning our family room. Yikes! I think I missed like the last 8 or 9 springs for the whole cleaning thing, so it was intense. However, its amazing how good it felt to come home this evening after work and see the fruits of my labor. Clutter corralled, dust bunnies evicted, carpet and upholstery cleaned. WOW! Who knew? Better than Prozac, no lie! Okay, maybe not, but seriously, it makes me want to systematically go through all of the areas of my home and do this. I have no pictures to share, but I will share a link with you that, at one time, I found very useful. I need to get back to visiting the Flylady once in a while. Her theories make sense and if you do what she says, you will have a clean, organized, well functioning home. Its a comittment, sort of like losing weight (also on my list) and getting regular exercise (another one, check! ), but worth it if you can at least do at least a smidge of her suggestions. Check it out if you have time. 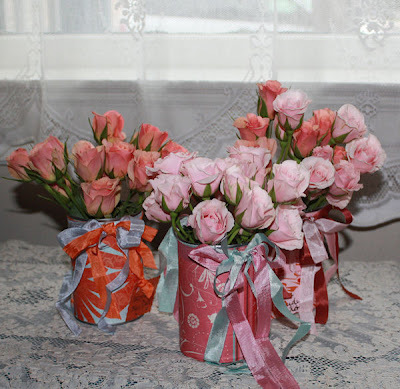 For now, I must finish my little May Day Flower Vessels that I'm going to gift my gal pals with tomorrow. Maybe I'll be smart and take pictures to show you. 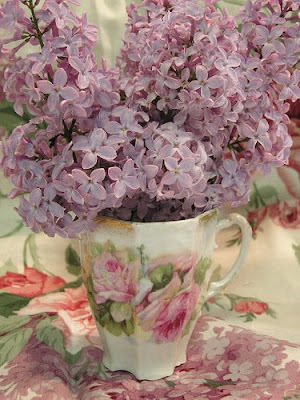 And just for the record, the photo above is a Flickr file (from the incredibly talented Polly) which has nothing to do with the post, except for having one of my favorite spring flowers, lilacs, in it. Which, in my part of the world, is more like an early summer flower, but that might be splitting hairs.